Apartment UJV 267, also known as Villa Wastra, has two bedrooms, two bathrooms and a pool. 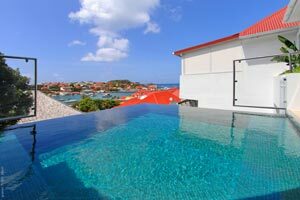 Newly built and modern it is conveniently located on the hillside of Gustavia, St Barts, offers a splendid view of the harbor and St Maarten. This villa offers the convenience of being downtown, but is still in a very private area (with private garage). Apartment UJV 267 is located just a few minutes from shopping, bakeries, restaurants, beach, nautical activities, nightlife, etc. The living room, well-equipped kitchen and dining room share the same room and open onto the terrace, pool and splendid view. Located on each side of the living room, the two air-conditioned king size bedrooms with ensuite bathrooms open onto the terrace and pool. Both are spacious and decorated in a contemporary style with modern amenities. The terrace and pool invite you to relax while admiring the beautiful sunset. Apartment UJV 267 is perfect for couples, families and friends seeking privacy. Villas Rents At High Season Rate For Thanksgiving.